The Annual General Meeting of VNBC was held on 13th October, with the reports for the past year highlighting the progress and achievements of the club in that time. Committee elections saw the re-election of Quentin Valentine as Club President, as well as Marcela Ferriera as Secretary, while new members were added to the committee as well. 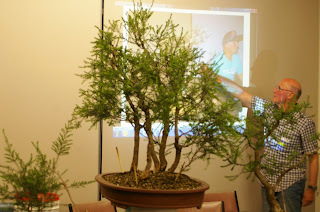 After the completion of the AGM formalities, and a presaentation and discussion of some of the trees on display, Quentin reviewed progress on the Melaleuca lanceolata (Moonah) group which he and others established as a demonstration at the Symposium in March. After some discussion, extra trees were added to the group to complete the setting, filling spaces left in the original grouping. 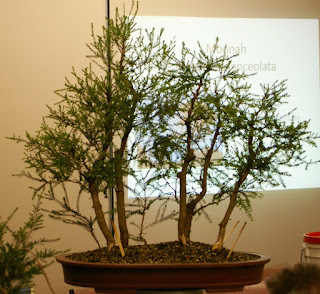 Other specimens of Moonah were discussed, both showing good budding back on older wood after considerable cutting back earlier in the year.